After a $2.5M renovation in 2016, the Backstage Theatre is now the crown jewel in the Breckenridge Creative Arts’ Ridge Street Campus. Featuring world-class performances in a state of the art theater, affordable prices, a full bar featuring Breckenridge Distillery products and beer from Broken Compass Brewing Company (and it’s cool to bring a drink to your seat with you), and located just steps off of Main Street Breck, this is a can’t-miss for any visit to Breckenridge, Colorado. Check below for their upcoming schedule and buy your tickets now! 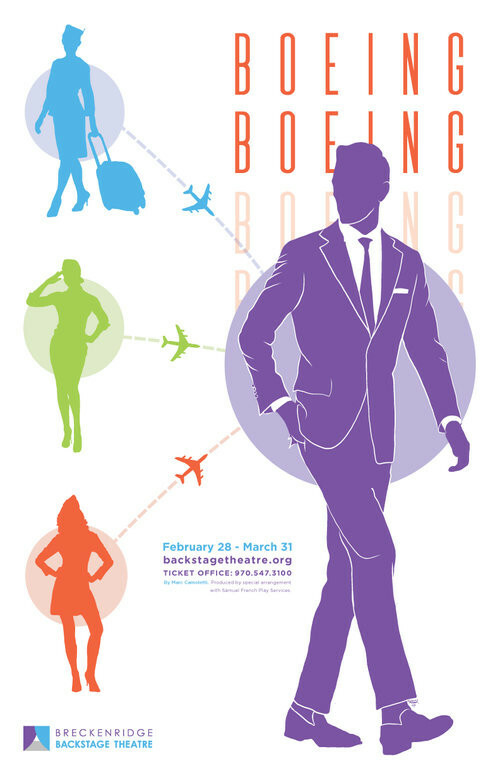 Breckenridge Backstage Theatre Presents Boeing, Boeing. This 1960’s French farce adapted for the English-speaking stage features self-styled Parisian lothario Bernard, who has Italian, German, and American fiancées, each a beautiful airline hostess with frequent “layovers.” He keeps “one up, one down, and one pending” until unexpected schedule changes bring all three to Paris, and Bernard’s apartment, at the same time. Breckenridge Backstage Theatre enriches, educates and entertains Summit County residents and visitors by letting them participate in and experience the joy of live theatre. Our passion is to inspire the community to embrace the performing arts and to expand their involvement with the theatre.